I read this book as part of my little unofficial Halifax Explosion fiction project, which includes other books, such as Barometer Rising by Hugh MacLennan, Black Snow by Jon Tattrie, and The Blue Tattoo by Steven Laffoley. This book made a nice compliment to the others in that it’s more about the long term effects of the explosion on one family’s life. Lucy and Harry had only been married a couple of years when the explosion rocked their lives. They lost their parents, friends, and first child as a result of the explosion. Lucy went into labour for their second child that night. She and Harry are eventually re-united, but their lives will never be the same. Not only will they grieve for what they’ve lost, but memories of that day will haunt them their whole lives. Soundlessly, a jet scores the spreading blueness overhead. Its plume links the clouds, cutting the path, perhaps, that fiery bits of metal once did. Parts of a ship, and souls sprayed like milk and eggs and perfume, invisible as a sliver in the heart, or a baby about to enter the world, leaving behind snug darkness. It’s not clear how well matched Lucy and Harry are to begin with, but the trauma they suffered and the loss of their first child hits them hard. Their different ways of grieving drive them apart until their marriage hits rock bottom. Harry spends his time drinking with his buddies, gambling, and hanging around other women, while Lucy grows more isolated and depressed. Their son Jewell is a product of this rocky marriage, and Lucy is always worried about him. God have mercy, for the sins of the fathers and mothers too, and give us hope, even if it’s pinned on things nobody will ever see. Despite Harry’s infuriating behaviour throughout most of the book, when he has a stroke in his later years Lucy is desperate to have him home again, warts and all. And after all this time, they are still not done with the twists and turns of living. This book is not an easy read; there is detail to pay attention to in the characters and the layers of the story. The narrative goes back and forth between the couple’s early years and the time of Harry’s stroke. Many, if not all, of the characters are hard to like; at times they are weak, vulgar, useless, helpless, and maddening. But they are human, and they put a face on real Haligonians as they struggled to put their lives back together after surviving a disaster that killed and injured thousands of people, and left many more homeless. The paper never fails to dig up a new tale each year, things trotted out that she can barely stand to imagine or relive. As long as there are survivors, there will be stories… though it stops her breath to think of herself that way, a survivor, like someone washing up from the ocean. My review of These Good Hands, Carol Bruneau‘s latest novel. Fancy Mosher is the twelfth born child, and heir to the “family memento”; the ability to see ghosts. She works at Petal’s End, the Parker family’s estate by the Bay of Fundy, where her mother worked before her, and where, more than any ghost, past events and family secrets haunt them all. The Globe and Mail calls The Memento a “classic spine-tingler, centring on a haunted house and children hovering between evil and innocence, power and vulnerability.” The adults are tight-lipped about the past, and the children are left to wonder and discover the terrible secrets on their own. It’s painful to witness the loss of their innocence as the secrets multiply and tragedy befalls the characters like falling dominoes; poisonings and drownings, crushed fingers and broken dreams. And the mystery of what happened on the island – only the children know, and they will never tell. None of us knew then, on that summer day, how all the lives and secrets wove together. An overwhelming desire to see the truth came over me for I wanted to be free. The Memento is an atmospheric book made up of a cast of eccentric characters; a delicious tale of family dysfunction, secrets, and ghosts. I highly recommend it for when you’re in the mood to sink into a big book and savour it. Once, a long time ago, you asked me what I was afraid of and I told you I wasn’t afraid of one single thing. That was not true. I was afraid of many things but talking about them only made it worse. I was never afraid of the dark, nor of animals, or creatures that howl in the night. But I was afraid around my mother because there was no fixing her. Stiff and old in my chair, I am only afraid now of what will be in your eyes when I see you, if you come out from wherever it is you are waiting. Afraid of the judgment, I suppose, same as what Ma feared she’d see in my eyes. It’s the details, isn’t it, that we remember? The eyes, the sound of the voice, the scent of the air, the way the light dapples through leaves onto the grass, or the perfect shadow of the winter branches on the snowy field, and how the child’s footprints on the sand are always washed away. This is what we remember. My review of Heave, Christy Ann Conlin‘s first book, in which we are first introduced to Fancy Mosher. 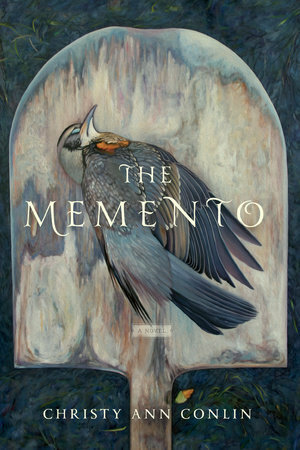 I love the cover and premise for The Memento; it sounds like a delicious haunted house novel. I’d never heard of the Halifax Explosion, but it’s not surprising that it’s been the subject of several novels. I’ve added both these titles to my TBR 🙂 Were they library reads or from your shelves? These were both from my own shelves. 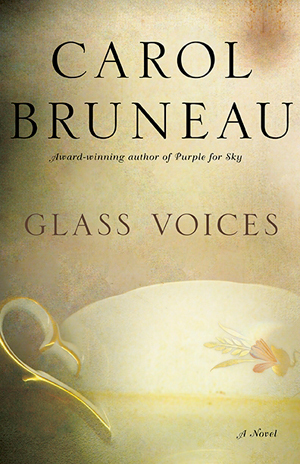 I finally found a copy of Glass Voices in a used book store this summer (I’ve had my eye out for it for a while), and I bought The Memento after reading Heave last year. I’m so happy to have tempted you! Love the sound of The Memento too! And what a great character name. The Memento is full of great characters! But talking about one of them would have led to talking about them all! I had a hard time whittling this review down to something manageable. I’ve already ordered The Memento. Sounds grippingly eerie. I can’t wait til it arrives. Glad to hear it, Brian! It’s perfect for a winter’s night (or two). These both sound wonderful, particularly Glass Voices. The quotes are beautiful. As are both covers! I’m going to have to read one of the novels about the explosion. I know you have reviewed several. Well, I don’t know if I would find very many locally, especially since we live in the country, but maybe I could get one or two from the library. And there is always Amazon. I thought the ‘ghostiness’ was just right – I wouldn’t have liked too much, but there’s just enough to make you wonder. I have Memento on the TBR – I agree it sounds really good – and I enjoyed Heave so I’m interested to see the connection. Re: the Halifax Explosion – have you read Rachael Preston’s The Wind Seller? It’s from 2006 but has a strong connection to the Explosion with its main character. No, I haven’t! And it’s not even on my list. Thank you – I’ve just requested it from the library! I looked up the 1917 Halifax Explosion on wiki — I’ve probably done this before when you last reviewed a book about it — it’s quite chilling. I wonder which books on that disaster did you like the best? It reminds me a bit recently of the rail (train) disaster in Quebec, which still chills me to the bone. It’ll have ramifications for the next 50 years …. no one forgets that. I was trying to decide the answer to your question just the other day (in case someone asked me!). It depends on personal taste, of course, and there are also nonfiction accounts of the explosion… but I think my favourite so far is The Blue Tattoo by Steven Laffoley. His is also fairly recent.